The transits for last Friday (when Obamacare replacement "RyanCare" failed, time of failure unknown) against Paul Ryan's chart are interesting. Transiting Sun conjunct Ryan Mars/Chiron: contention and injury. Transiting Mars square Ryan Sun/Venus: more contention/conflict. Transiting Ceres trine Ryan Mercury: language taken away. Transiting Saturn square Ryan Pluto: power, restricted. 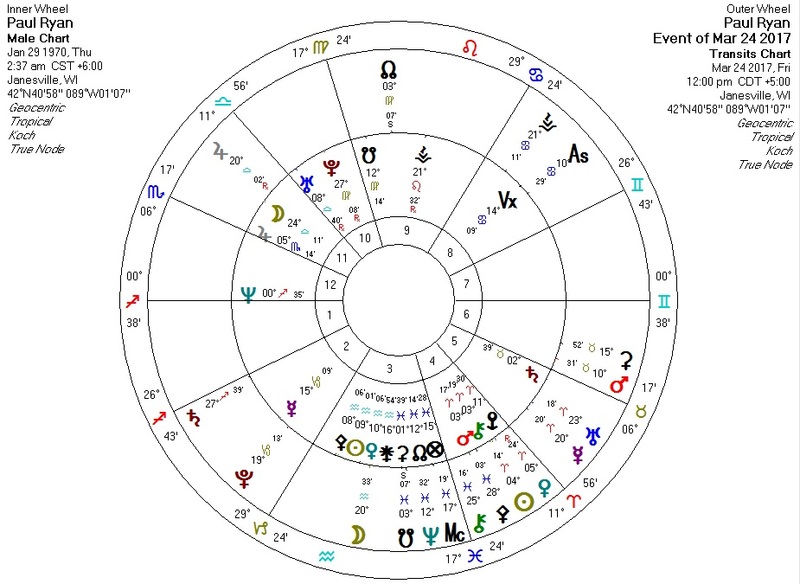 Transiting Mars square Trump Pluto: a challenge to his power. 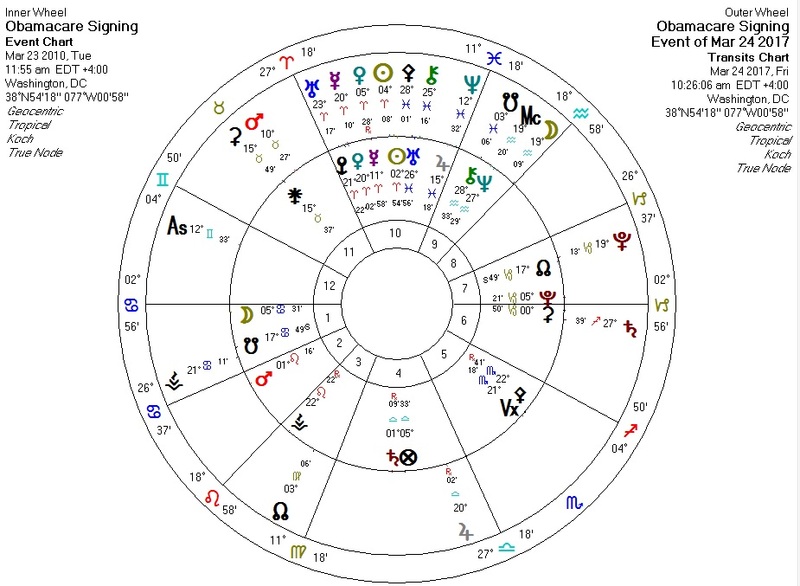 Transiting Uranus square Trump Saturn: disruption of structure/authority. Cernovitch explains why the RyanCare failure last week was actually a Trump victory. Pat Buchanan somewhat agrees. So perhaps this was less damaging to Trump than to his de facto enemy Ryan. 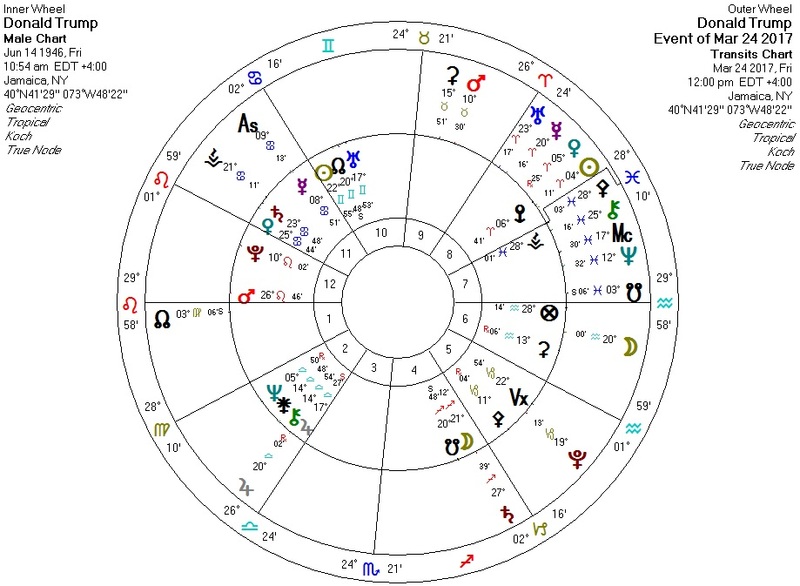 Transiting Mercury conjunct Obamacare Venus: good news. Transiting Jupiter opposite Obamacare Venus: possibly very good news. The Republicans chose the wrong week to try to push this bill. Or did they? RyanCare is said to be not much different from Obamacare -- which suggests that it, too, would have been financially unviable. If there's going to be an non-viable health care system, better it be under the banner of the other guy?